The Nigerian Army on Wednesday disclosed that troops of 145 batallion engaged Boko Haram terrorists who attacked their location around 6:00 p.m. This attack comes few days after the Chief of Army Staff, Lieutenant General Tukur Buratai visited Gudumbali after last week’s attack on military locations in the area. Buratai who is still in Gudumbali earlier arrived Maiduguri on Sunday and led the Theatre Commander Operation Lafiya Dole and other principal officers to Gudumbali on Tuesday. 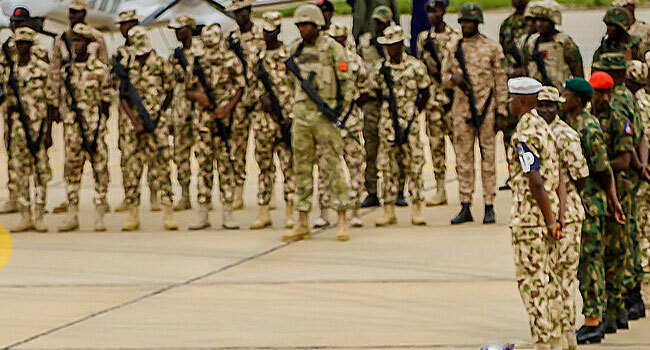 The visit of the Army Chief, who has been assessing military formations and armaments in Northern Borno is intended to build the confidence of the locals and troops in the troubled areas.